As a homeowner, you’ve got plenty of daily home tasks to keep you busy; you don’t need to worry about potential ice damage, too. Now, you can rest easy knowing that our DIY roof ice prevention systems can protect your home. Snow and ice cause a variety of expensive and stressful problems to your home, both inside and out. Often, in severe weather conditions, snow can melt and refreeze, causing ice dams. Ice dams are very thick ridges of solid ice that can build up along the eaves and inside gutters. The damage that ice dams can cause can be extremely detrimental to the structural integrity and value of your home, including water damage inside the walls. So, being proactive about effective roof ice prevention before the winter season hits is crucial to keeping your home safe all year around. Whether you’re a do-it-yourselfer or prefer professional installation, Heat Trace Specialists ice prevention solutions are the perfect solution. Simply order your preferred ice dam prevention system and install it yourself or contact your local contractor. 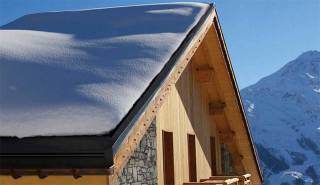 Our proprietary SnoFree™ Heated Roof Panels are an elegantly designed, energy efficient, and permanent ice dam prevention solution for homeowners seeking to reduce ice dams during the winter season. 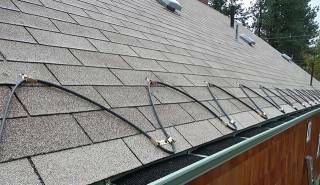 The installation of zig-zag heated roof cables is a more affordable permanent ice prevention solution. They are easy-to-install and great for mild climates. Design your own system by using our calculator here. Temporary ice dam prevention solutions like our Ice-B-Gone Heated Blankets are a quick and affordable solution to reduce ice dams before they do serious damage. Plus, a temporary solution allows you the extra time needed to find and install a permanent ice melt system. Click here to get a quote or call us at (877) 244-1055. Ask your local contractor about Heat Trace Specialists ice dam prevention systems!